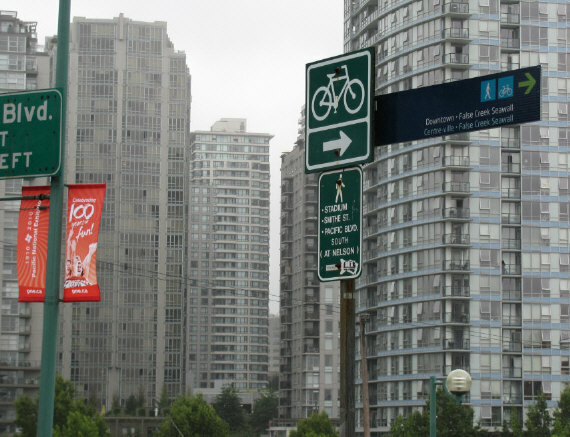 Bike route sign among high rise towers in Vancouver, BC. Archive of essay that was on front page of my web site a while back. Bike paths among the high-rises can be more tranquil than having to commute long distances by car in rural areas. Vancouver, BC, just north of Bellingham, has a lot of good planning for density and car free lifestyles. In the future, it is likely that density will be used to lower the carbon footprint for large populations. Cities can preserve farmland by keeping most people out of the farmland; thus protecting it for true farming. When the farmland isn't too full of traffic, it's better for biking also. I'm living in the slow lane, but my lifestyle is not rural. It's more urban. I live in downtown Bellingham. My residence is a small space, mostly one room. Slowing down isn't necessarily "low tech" either. If a whole library can fit on computer chips, one need not use up lots of space for book shelves. Living in a small residence can work. Much of my thinking is about lowering the footprint and slowing down, but doing it in an urban and high tech way. This may be a rare perspective since most of the environmental sites seem to talk about living rural and returning to low tech. I think high tech and urban will be the future, for most people at least. Hurray for car free living. Some Vancouver bike path pictures.